In this Paper # 85 (December) we will examine the dynamics of the M(y,x) and the F(x,y) vortex hemispheric sub-units and the role they play in the gene energetics (Genergetics). The origination of the Andronover nebula vortex and its hemispheric has been discussed in the previous Papers posted on www.LighttoParadise.com. The existence of the vortex hemispheric subunits has been referred to in the Urantia Book (see exhibit A below) and observed in the celestial and planetary inorganic and organic bodies (see exhibits A-E). 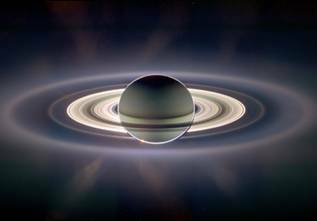 Saturn’s rings backlit by the Sun. The term “genergetics” itself has been coined to explain the principles of the underlying energy dynamics involved in the evolution of the cellular genetic material (chromosomes) which would hopefuly afford the reader with the better understanding of the underlying gene energy mechanics and the better understanding of the role of the Male and Female energy forms involved in this process. It is now possible to understand that the Male PUMA (ANU) vortex unit expression in totality is the sum expression of its hemi-spheric charge-polarity (y,x) sub-units interferences, while the Female PUMA (ANU) vortex unit overall expression is the sum expression of its hemi-spheric charge-polarity (x,y) sub-units interferences. These PUMA (ANU) vortex hemi-spheric sub-unit vortexes are in addition responsible for the overall expression of the male vortex male-ness unit character (expressed from the strong/dominant male to weak/non-dominant male spectrum) and the female vortex female-ness unit character (expressed from the strong/dominant female to weak/non-dominant female spectrum).